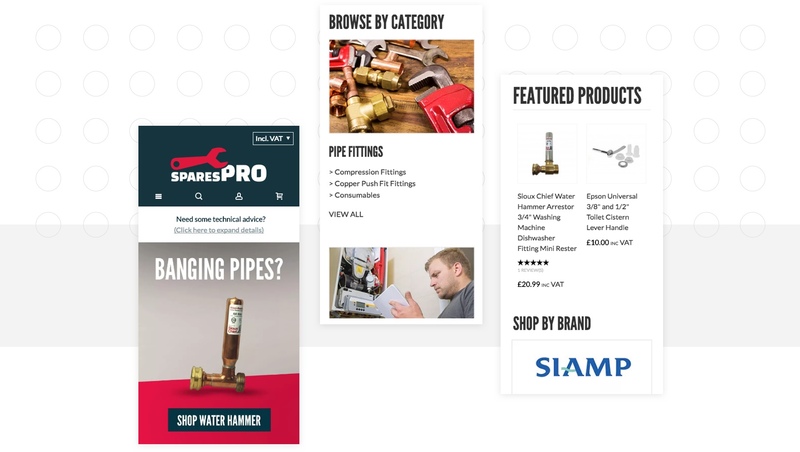 Having previously been focussed exclusively on business to business sales in the past, SparesPRO wanted to set out on their first direct to consumer venture selling plumbing parts and accessories. Our mission was to build a user-friendly website to attract new customers, develop a positive reputation and ultimately yield transactions. The logo and brand identity was the starting point to the project. It was vital to create a memorable but simple design in order to best connect with new targeted customers. This would also set the tone and style for the brand image which would be used across both print and digital marketing formats. 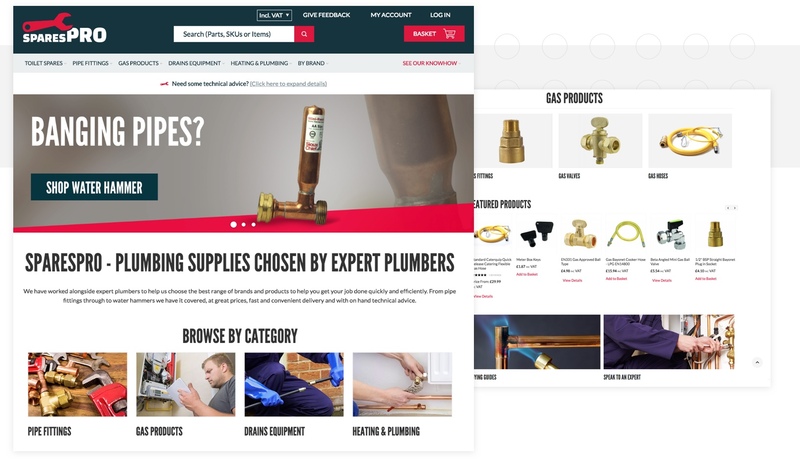 Having years of plumbing and specialist experience across the team at SparesPRO, showcasing this expertise was critical in the development of their Magento offering. Alongside the multi-site setup between their B2B and B2C channels, magic42 built and integrated a blog as a content companion for the main shop. Whether you are an avid DIYer at home or an independent tradesman on the job, the SparesPRO site puts all the information you need at your fingertips; no matter the screen size. From rich images that show all the finer details, to touch-friendly and easy-to-navigate menus, any customer will be able to find what they’re looking for. Having never sold directly to customers before, SparesPRO have continued to utilise magic42’s real world retail experience through the launch of their site and beyond. Below are a few of the stand out features we’ve introduced over time. While SparesPRO is focusing on a B2C venture, the nature of their products leads to many independent tradesmen or small businesses shopping on the site. Including the option to switch between prices including or excluding VAT site-wide has proven to be a major benefit to conversion rates. The world of tools and plumbing can be a complicated one, and SparesPRO wanted to be able to share their expertise through every stage of the customer journey. The photo uploader has seen great engagement from people looking for a solution to their problem, a replacement part, or advice on what to do next. Furthering SparesPRO’s desire to share their knowledge with potential customers, a blog was a must have. Styled to match the layout of the main site, the content has touched on many different topics including how tos, installation guides, and general advice.